We are here to help. Please contact us with any questions. Set your practice apart with ClientLine newsletter. 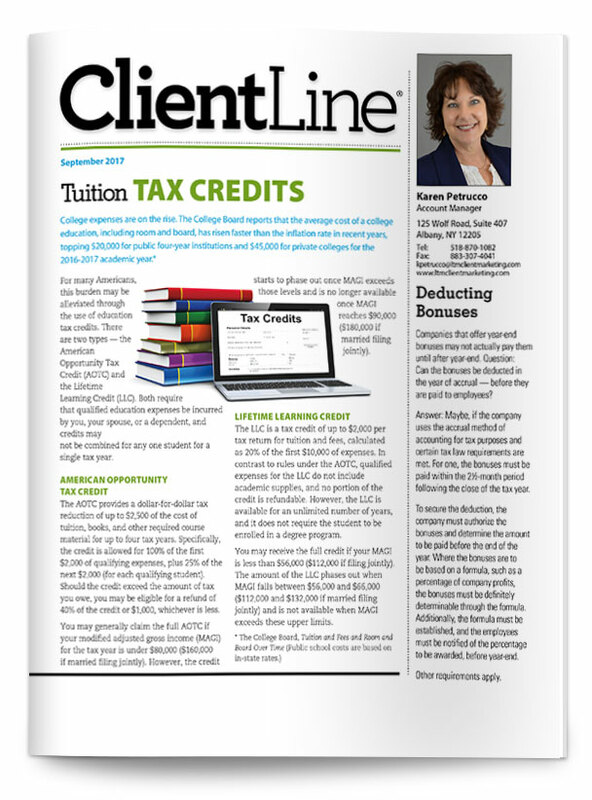 Focused on accounting, tax, financial, and business topics, ClientLine is an effective practice-building communication that you can send to your clients and prospects. Features articles for businesses and individuals. This monthly newsletter engages both clients and prospects with an entertaining and informative range of accounting, tax, financial and business articles. With its mix of easy-to-understand articles and colorful graphics, ClientLine® is the perfect tool for engaging your clients and prospects all year round. Articles cover a range of tax, accounting, business, and personal finance topics. Your newsletters can be mailed directly to your clients and prospects or bulk shipped to you. A HTML that allows you to link to your website. Click on the picture to see our ClientLine Newsletter version in action.